The amazing video of the night sky above the northern United States shows stunning meteors, the cloudy Milky Way, and even rainbow-colored auroras, called "Temporal Distortion," was captured by astrophotographer Randy Halverson. An spectacular time-lapse video of the night sky above the northern United States shows stunning meteors, the cloudy Milky Way, and even rainbow-colored auroras. The amazing video, called "Temporal Distortion," was captured by astrophotographer Randy Halverson, and set to an original score by Bear McCreary, who has composed music for television shows such as "Battlestar Galactica," "The Walking Dead," and "Eureka." "What you see is real, but you can't see it this way with the naked eye," Halverson wrote on his website, Dakotalapse.com. "It is the result of 20-30 second exposures edited together over many hours to produce the time-lapse. This allows you to see the Milky Way, aurora and other phenomena, in ways you wouldn’t normally see them." As the starry night sky changes over shots of gnarly trees and grassy fields, the occasional bright meteor can be seen streaking across the sky. And certain shots showcase the glowing light of the aurora, also known as the northern lights, which were visible in Wisconsin on Oct. 24, 2011 and in South Dakota on Sept. 26 and 27. 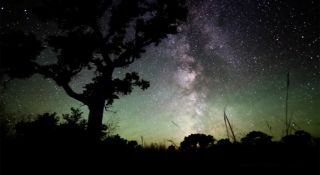 "With that [October] event, the ground was so bright you could see your shadow from the aurora and the red was easy to see directly to the north and overhead with the naked eye," Halverson told SPACE.com. "It was bright like that for 45 minutes or so." The earlier auroras in September had been a surprise. "I wasn't expecting them and was actually planning on shooting the Milky Way, when I noticed a faint glow far on the horizon," Halverson said. "After a few test shots I could see the aurora on the LCD of the camera, but it wasn't very [visible] with the naked eye. It took 30 second exposures to make them show up that well." Halverson took the stunning footage using Canon 5D Mark II and Canon 60D cameras. For the moving camera shots, he used a Dynamic Perception Stage Zero Dolly. For more information and astrophotography footage by Randy Halverson, visit his site: Dakotalapse.com.